“I won’t resort to threats, Mr. Harley. I merely tell you the future of your planet is at stake”. Science fiction lovers rank this among the best of all time. It’s certainly one of the most intriguing and still impresses people today as it did 60 years ago. 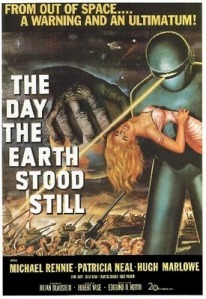 An alien named klaatu lands on planet earth to deliver a warning: humans must live peacefully or be destroyed. Simple, yet incredibly entertaining and visually impressive (considering this was made in 1951!). But was the 2008 remake really that necessary?